Transportation of goods by sea in the North difficult. Thick crust of ice covering the ocean surface restrict the movement of vessels, making swimming impossible. 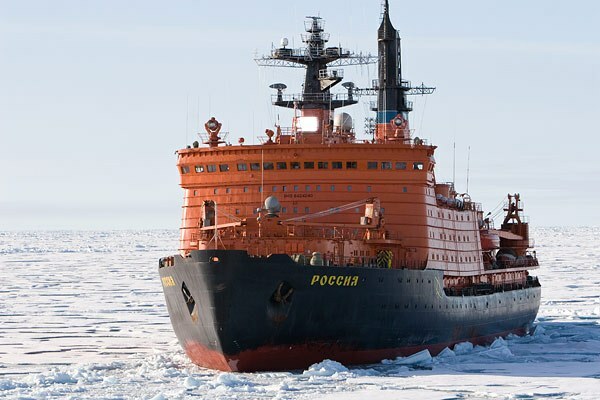 To solve this problem, use the auxiliary vessels – icebreakers. These powerful ships capable of breaking ice covering, creating passages for the transport of caravans. From school physics course known that a body immersed in a fluid, the force that pushes the object upwards and equal to the weight of the displaced fluid. On the ship, in the ice, applies additional lateral pressure, which is able to crush an ordinary ship, like egg shells. For this reason, the cross section of the hull of an icebreaking vessel is performed in the form of a nut, and do the waterline below the widest part of the icebreaker. The forces acting on the icebreaker, will try to push him, not crushing. Design features of the icebreaker does not end there. For thickened lining of the icebreaker hiding system, reinforced frames and stringers. The entire hull is divided by watertight bulkheads into several compartments. Waterline is the "ice belt" - a strip of reinforced, able to withstand the tough ice. In the bow and stern of the hull has a bevel contours. Made it to the icebreaker, it was easier to move in ice in the Shuttle mode, i.e. forward and backward. To overcome the friction of the hull on a mass of ice, also use a special washing device having small holes through which pumped air bubbles. The action of an icebreaker – it's not easy chopping ice, as it could follow from the name of the vessel. Note that part of the ship, which leaves the water and creeps to the layer of ice ceases to be balanced and gain weight. Therefore, the ice breaker is more convenient to chop ice and breaking it with his weight. The vessel is really in some ways reminiscent of the work of the Shuttle: icebreaker steps back, and then all his weight pressed on the edge of the ice cover. Energy multiple shock allows you to effectively break the hummocks several metres thick. The inventors wondered how to make the work more efficient icebreaker. Attempts to break the ice or cut it on a course of movement of the vessel devices in the form of a cutter has not justified itself. And then came the idea to try not to work the vessel as a cleaver and use the principle of a razor blade. The essence of the invention is that a modified icebreaker is divided into the surface and underwater parts connected by a narrow and sharp knives. Such a scheme would significantly reduce energy consumption and to accelerate the movement in the ice. While such ships only designed, but has already received the name semi-submersible vessels.